Shopping for my three cats can get a little pricey at times. And as a loving Master who loves doting on my fluffy cats, I am constantly on the lookout for great deals and online coupons that let me shop 'n save for the best cat toys and products for Chubbs, Benji and Phoebe. Savings.com is a super saver online store that lets me do just that. How it works is pretty simple too. All you have to do is click on any of the many available Savings codes prior to shopping at your selected store. Once you're done shopping from the comfort and convenience of your home, just enter the Savings code to enjoy your discount instantly! By the way, there are coupons for every category imaginable including Electronics, HP promo codes under Computers & Office, Toys & Games, Kids & Baby, Apparel, Shoes & Jewelry and even Pets! Aside from new playthings for my fluffies, I am also mouse-hunting for my Dell PC and yes, coupons for Dell are available too! So far, I love it here at Savings.com and I have to say that this super saver discovery came at the right time. Check out this lovely Tumble Cat Bed for instance. 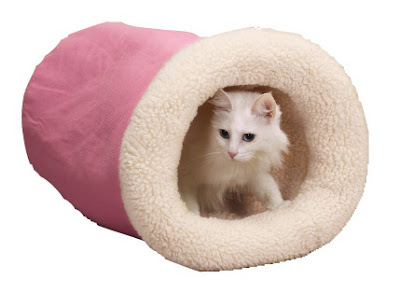 I found it in one of the many pet stores at Savings.com and it is going for only $25.98! It's pink and it's soft; purr-fect for Phoebe don't you think? If you love shopping online and you love to save even more, please visit Savings.com. I am confident you'll be very pleased with the wide array of awesome products you can find here at great discounted prices. Don't forget to key in your Savings code before checking out to truly enjoy shopping while saving, have fun! good muahnin to meows too! did i make the chop..??? hjehehe... i just woke up! :* :* :* :* Elai Meow 2! :* :* :* And LJ Meow 3!